Standard Production Time: Package will ship within 3-9 business days. 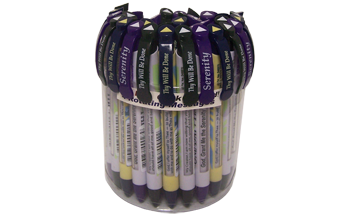 This discounted value package contains an assortment of 36 Recovery Prayer Pens at 30% off regular price! This is a perfect collection of Recovery Pens for area events, round-ups, conventions, and more! You can visit the above links to see the actual rotating message that each Recovery Pen displays. 1-2 Canisters (36-72 Recovery Pens) = $ 1.39/ea. 3 or more Canisters (108+ Recovery Pens) = $ 1.00/ea.